Good, Mary, head-of-household, age 48, born in Indiana; parents born in Indiana; married, first married at age 22; owned home ($6000 value); no radio in home; occupation: none. Good, Helen, daughter, age 22, born in Indiana; father born in Kentucky; mother born in Indiana; single; occupation: none. Good, Marion, son, age 19, born in Indiana; father born in Kentucky; mother born in Indiana; single; occupation: file clerk, insurance co.
Good, Cecil, son, age 14, born in Indiana; father born in Kentucky; mother born in Indiana; single; attended school. 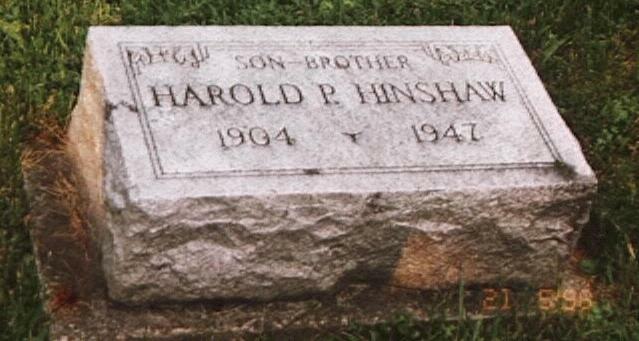 Hinshaw, Harold P., son-in-law, age 25, born in Indiana; father born in Kansas; mother born in Indiana; married, first married at age 23; occupation: condensor, radio shop; not a veteran. Hinshaw, Elva, daughter, age 25, born in Indiana; father born in Kentucky; mother born in Indiana; married, first married at age 22; occupation: cashier, gas plant. GEDCOM file g1682.ged at http://www.ancestry.com citing: gravestone inscription. 1910 census, Indianapolis, Wayne Township, Marion County, Indiana; roll T624-369, ED 265, page 170A, line #30, dwelling #168, family #171. 1920 census, Washington Township, Marion County, Indiana; roll T625-450, ED 22, page 1B, line #65, dwelling #18, family #18. 1930 census, Indianapolis, Washington Township, Marion County, Indiana; roll T626-609, ED 333, page 5A, line #7, dwelling #72, family #72.